Shoreacres is one of the courses that I was really looking forward to on the list. I didn’t know anything about it other than everyone who plays there seems to come away in love with the classic Seth Raynor design. 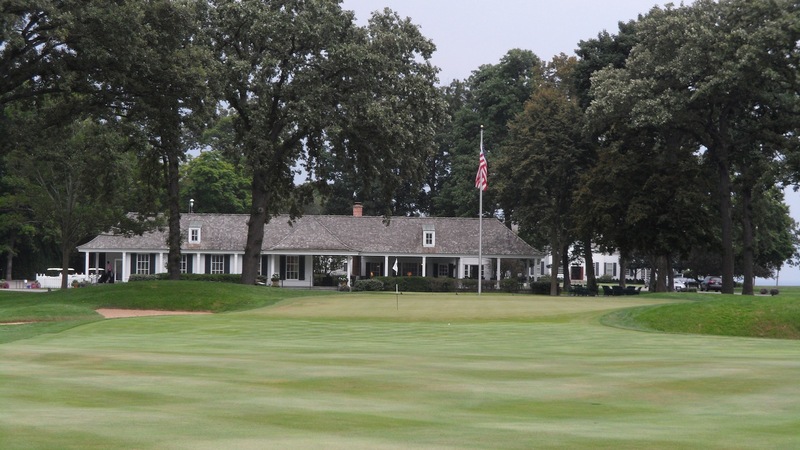 Located just north of Chicago in the town of Lake Bluff, Shoreacres has occupied its perch on the shore of Lake Michigan since 1916. While the clubhouse does have a water view I should point out that the golf course itself is completely inland with no views of the lake or coastal holes anywhere on the course. In scouring the internet for information on the club there is very, very little available. I usually like to learn a little bit of history about a club before visiting but the best I could find in this case was a very abbreviated take on the club’s 94 year history. 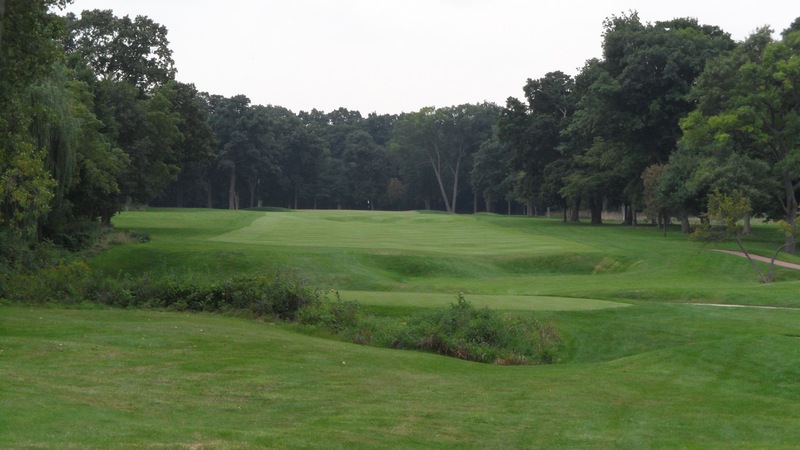 The short story is that the club was founded in 1916 and the course designed by Raynor opened in 1921. 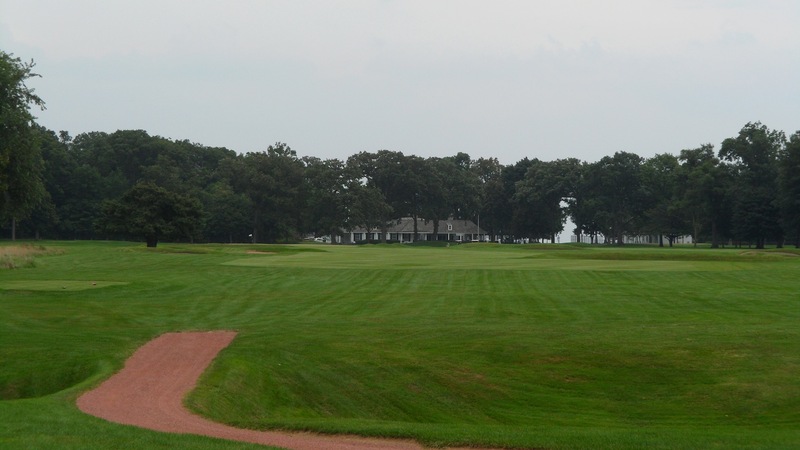 After 70 years the course had lost many of its “Rayor-esque” qualities and Tom Doak’s firm Renaissance Golf was brought in to restore the design to its original glory. From what I hear they did a masterful job. In an interesting side note I did discover that the original clubhouse, built by David Adler, burned to the ground in 1983. A local Chicago architect by the name of Laurence Booth was commissioned to build the new clubhouse which is in use today and compliments the style and vibe of the club perfectly. We decided to play from the “Raynor” tees which play to 6,309 yards and, as I understand it, are the course’s original tees. Sometime in the recent past there were back tees added to 8 holes which allow for the tips to stretch out to 6,530 yards . 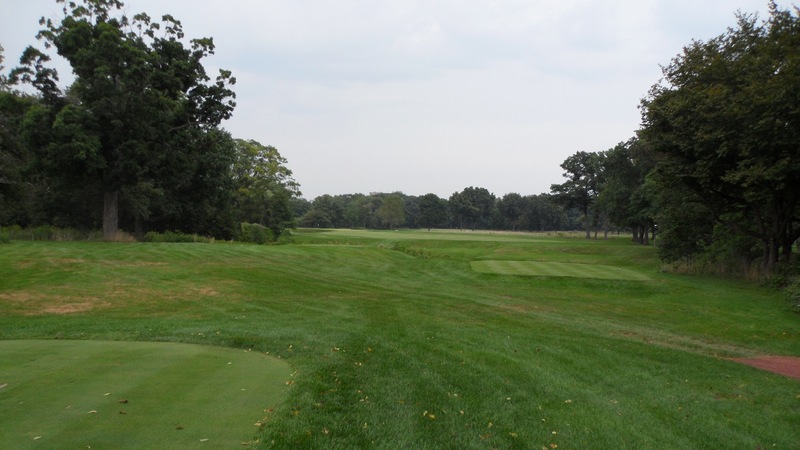 . . this does modernize the course a bit, but even the new tees are fairly short and very manageable for the average golfer when compared to many of today’s modern courses. Raynor starts the course out fairly friendly on the 1st hole with a 478 yard par 5. 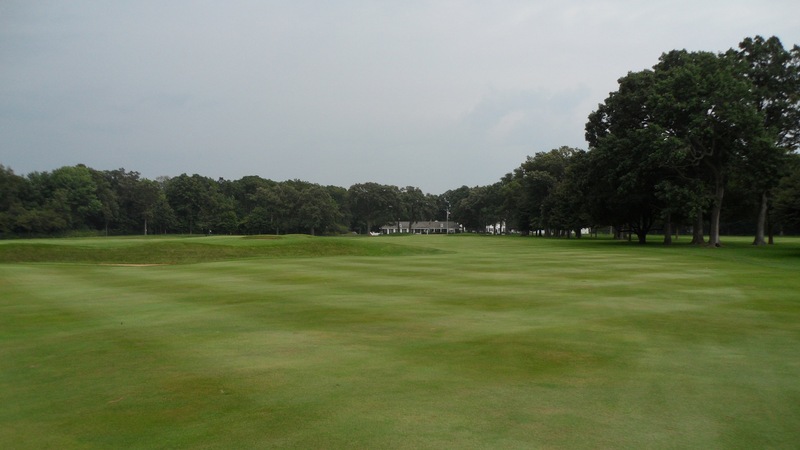 The photo below was taken from the tee box and as illustrated is a fairly straight and flat hole. 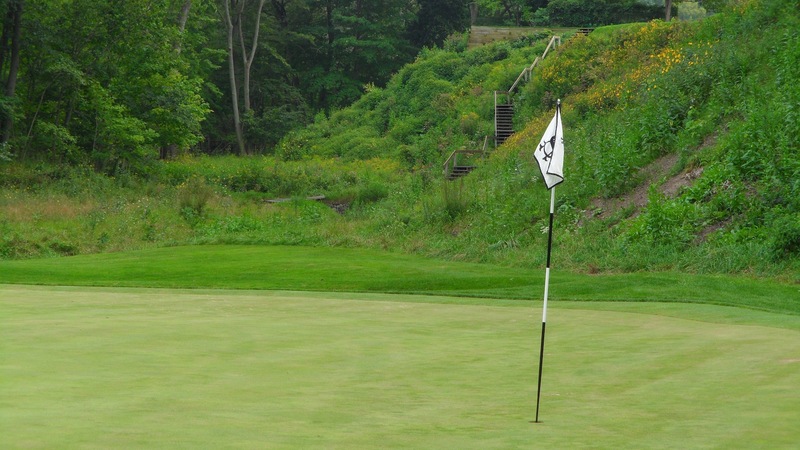 Below is a photo that was taken from a little more than 200 yards out from the green. If a player is going to lay up on the second shot it will be a good idea to make sure to clear that bunker as it makes for a tricky approach to the green if you are making the third stroke from the bunker. This is not as much of an issue from the Raynor tees as it is from the back tees. The 1st green complex is shown in the photo below. 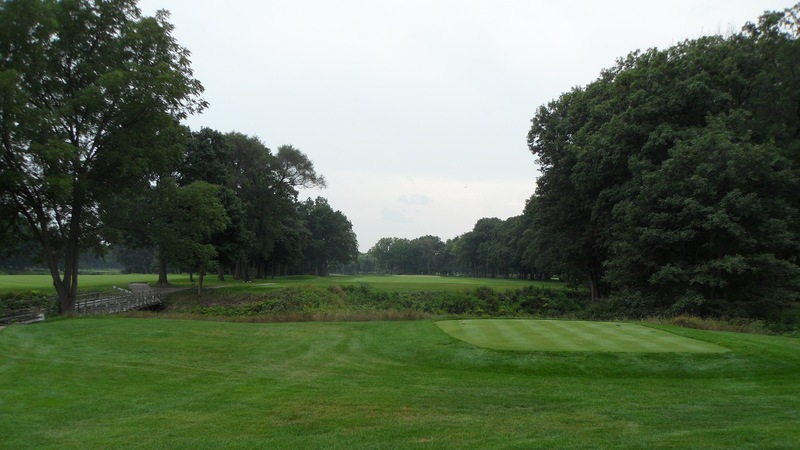 At the 2nd hole, pictured below, we begin to get a better picture of the course’s personality. This 341 yard par 4 is a dogleg left which requires just a 200 yard drive to leave a very reasonable short iron into the green. 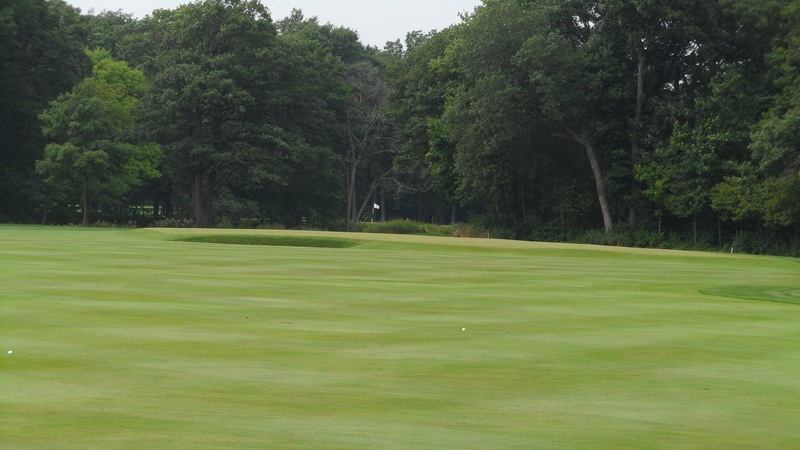 Below is a photo of the approach shot at the 2nd hole. The flag was at the front of the green which has a fairly severe slant to it and left a fast downhill putt after my approach shot went long. The 3rd hole is a very short 309 yards (from the back tees as well) that is definitely drivable for the big hitters. Even those who are not long with their drivers can leave a very short pitch to the green if they are bold enough to hit driver here and manage to keep it in the fairway. 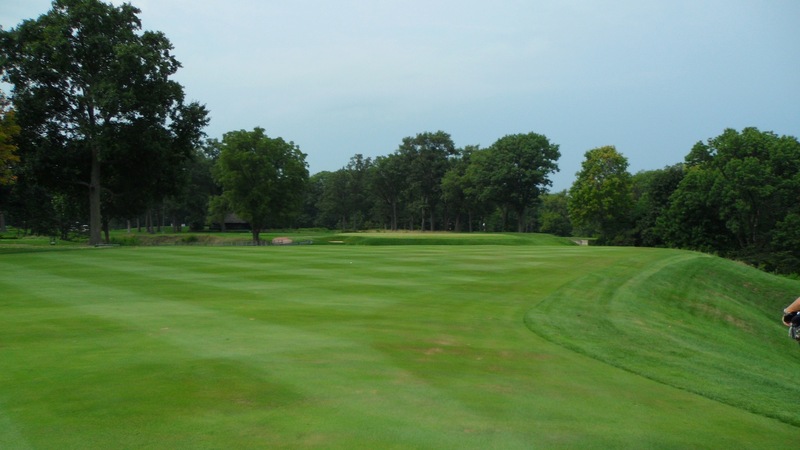 The safe play is a 200 yards shot down the middle with a long iron or hybrid. 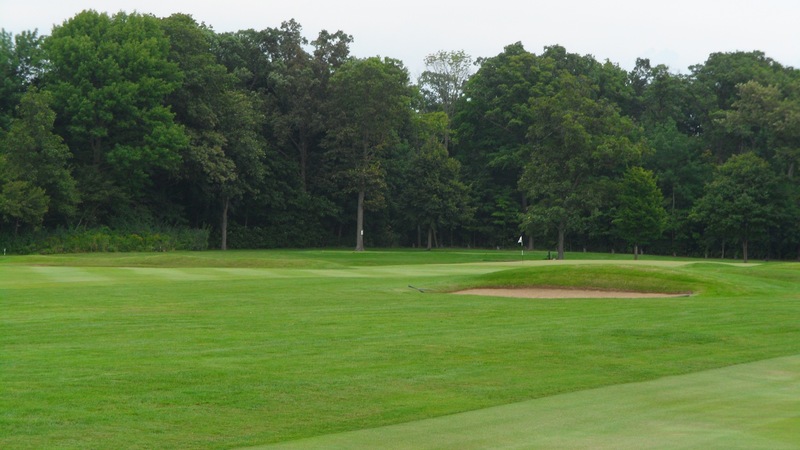 Below is a photo of the 4th hole which we played from 372 yards to a par of 4. 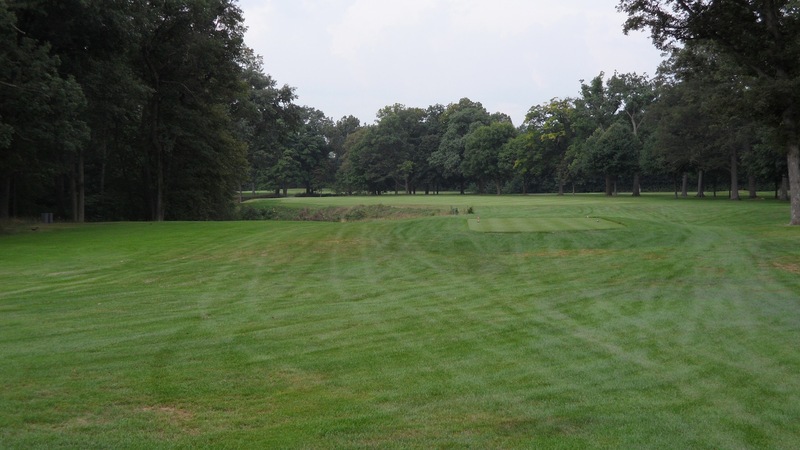 The swales in the rough beyond the right side of the fairway make for a difficult approach shot so it is best to hit a drive that favors the middle or left of the fairway. The swale effect of the rough area to the right of the fairway is also present in the fairway, though it it much easier to execute a shot from the uneven lie when hitting out of the fairway. From where my ball is on the right edge of the fairway in the photo below is just 140 yards into the green. 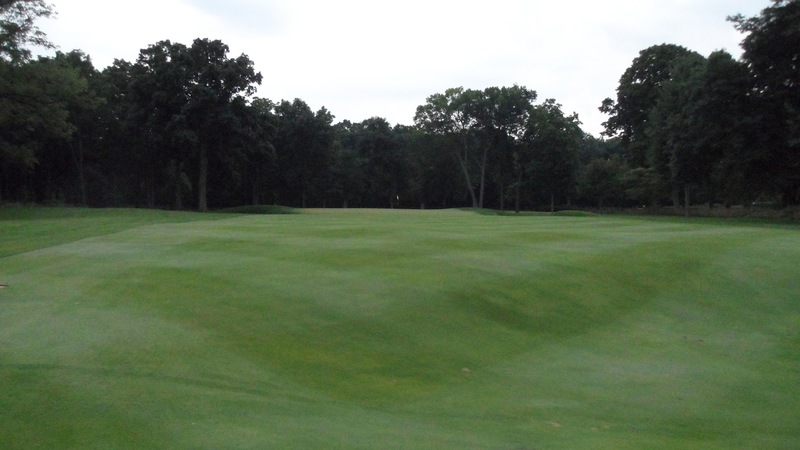 Below is a photo of the 4th green which shows some bunkering typical of what is found at Shoreacres. The 5th hole is a long par 4 that we played from 449 yards and the first time that the ravine is present throughout property really comes into play. The photo below was taken from the tee. 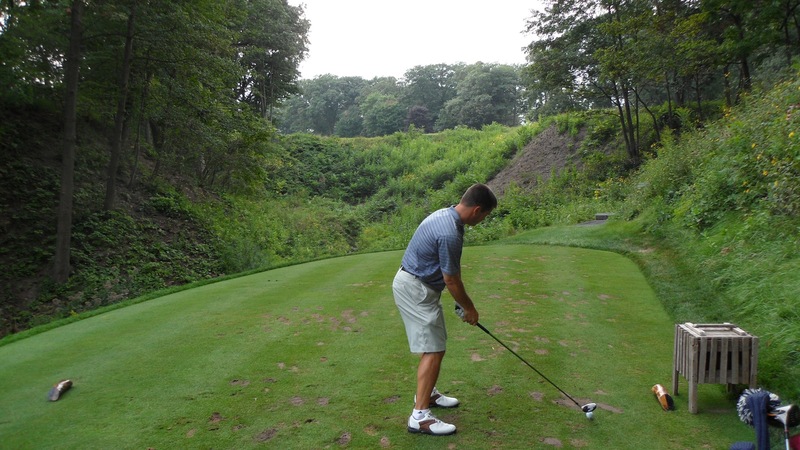 You have to hit the ball a really long way for the ravine to come into play on the drive. Below is a photo taken from just short of the ravine. My drive here was hit into a bunker and I was forced to lay up to this point which requires a lengthy shot into the green. Note that the ravine contains closely mown turf, so hitting into it is not necessarily a guaranteed penalty. 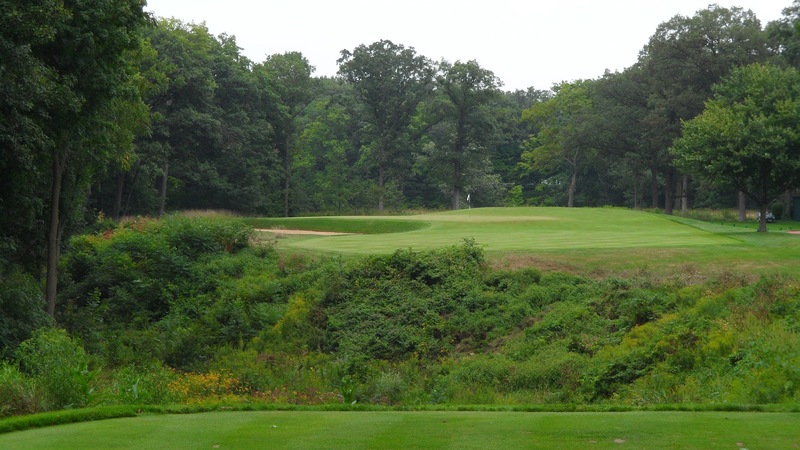 The 6th hole pictured below is the first par 3 and it is a Biarritz template hole that plays 192 yards. There are no bunkers in the front of the green so a low running shot is definitely an option here. 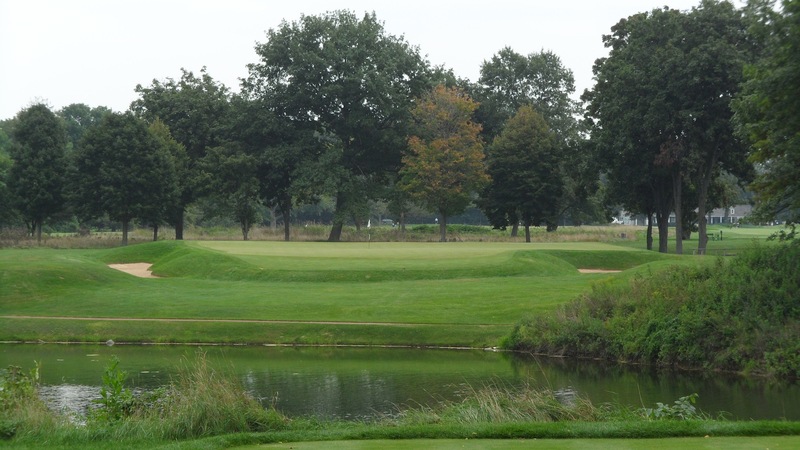 Below is a zoomed in photo of the Biarritz green where the swale is a bit more visible. The area before the swale is mown to putting surface length which is something I have not seen at the other Biarritz holes that I have come across. 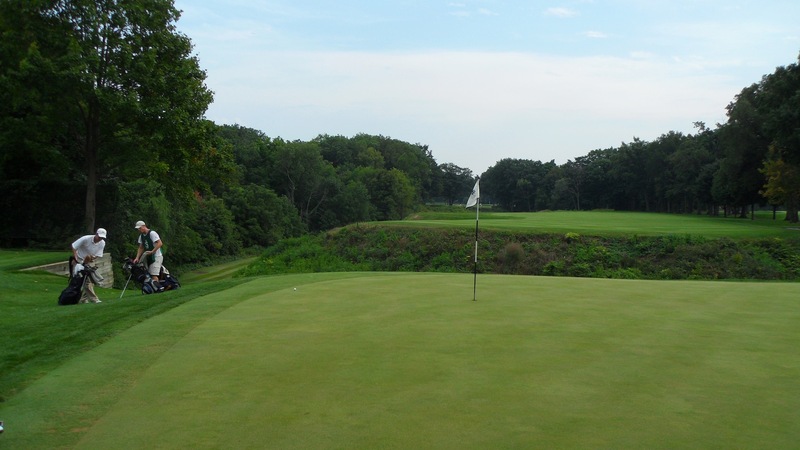 Below is a photo taken from the tee box of the 7th hole which is a long par 4 we played from 416 yards. The ravine is strictly visual intimidation here as it should not come into play on the drive at all. The photo below is a more zoomed in shot of the hole taken from the forward tees. 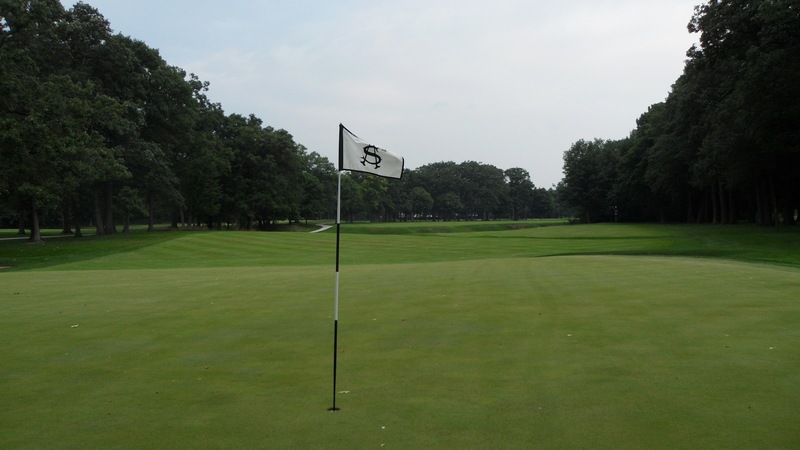 The fairway here, like many at Shoreacres is generous, but for the players who get too far off track the trees can wreak havoc on the shots into the green. The 8th hole, pictured below, is a nice little par 3 which requires a carry over water. The hole plays 165 so it is just a short to mid iron for most players. 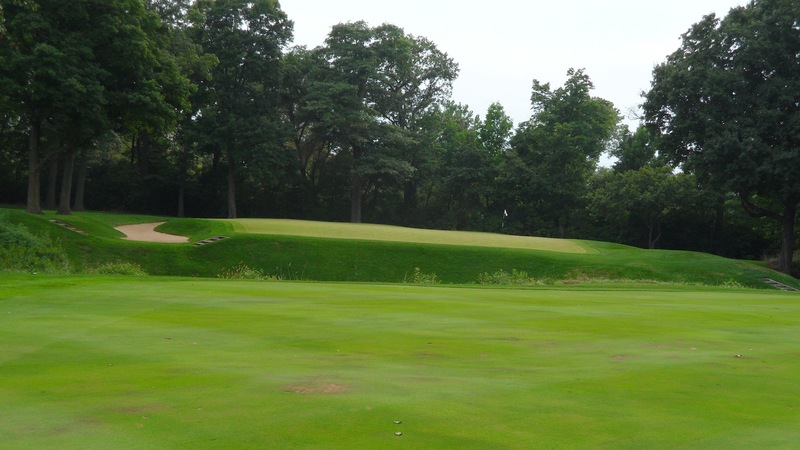 Below is a photo of the 9th hole which is a 388 yard par 4 that returns to the clubhouse. As shown below the hole is wide open. I hit a poor drive but was still able to play my approach shot from the fairway . . . the adjacent 18th fairway that is. The photo below was taken from where my approach shot on the 9th hole was played from. The 10th hole is a nice dogleg left that we played as a 432 yard par 4. The ideal line for the shortest approach shot is down the right side of the fairway. That said, drives must avoid going too far right as there is bad trouble (uneven ground covered in rough) and worse trouble (out of bounds) lurking over there. The photo below was taken from the tee. 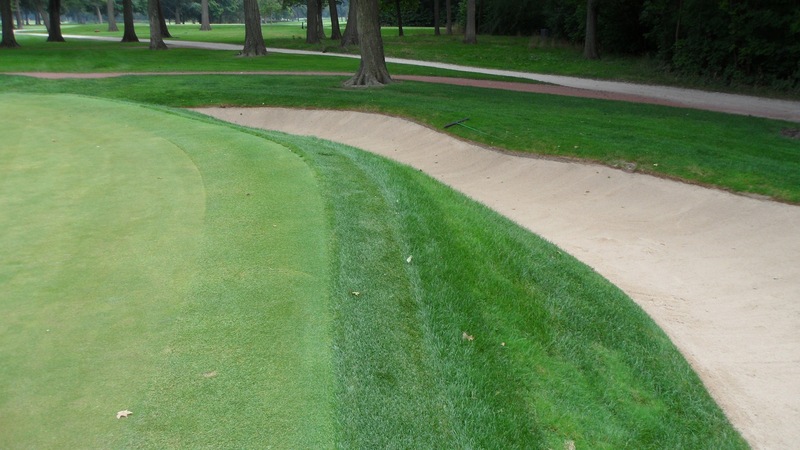 Below is a photo of the green complex at the 10th hole with its Road Hole bunker protecting the green. The par 4, 352 yard 11th hole is another spot where the ravine comes into play, but in this instance it really comes into play. 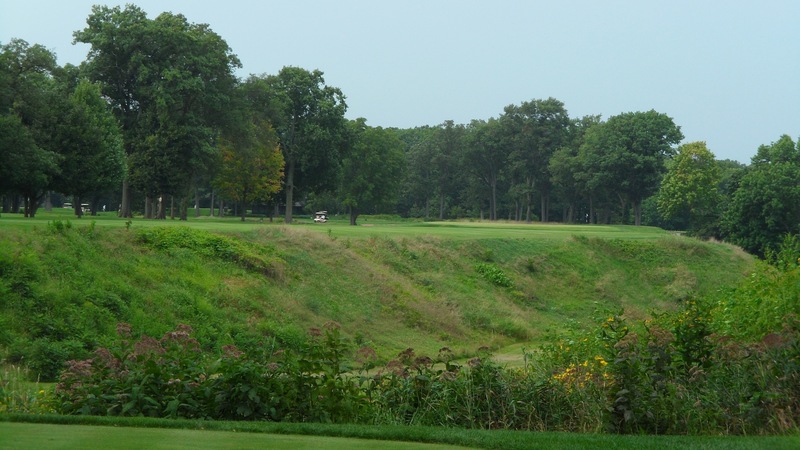 The photo below was taken from the tee box and as can been seen the drive requires a carry over the ravine. The ideal line is left, left, left. Clearly anything over to the right can be a problem. Alas, I did not execute well and my drive veered right and into the ravine. One of the things that I really liked about Shoreacres is that trouble does not necessarily mean death. My caddie assured me that I would find my ball and predicted a birdie or par. I liked his optimism. 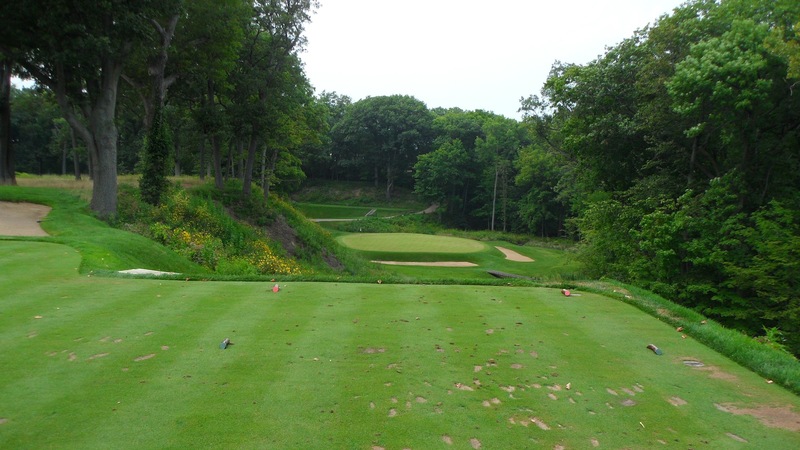 The photo below was taken from the fairway just before I took a sharp turn right down into the ravine. Below is a view back down the hole. If you look behind the caddie there is a patch of closely mown grass down in the ravine. This is where I hit my second shot from. My ball is the one closest to the hole in the photo below, so my astute caddie’s prediction of birdie or par was a well conceived one. I really wanted to make the birdie, but I just missed it and tapped in for par. A very cool hole that I enjoyed playing the unconventional way. After the 11th hole it is just a few short steps to the 12th hole. Once on the tee box players are delighted with a view of the short 127 yard downhill par 3. The photo below was taken from the tee box. I played a shot about 10 yards less than the hole distance and safely landed on the green. Below is a close up view of the green. And below again is a look back up the hill towards the tee box and the stairs. The 13th hole is a 332 yard, par 4 with a blind tee shot. It makes for quite an interesting start to the hole. All that is necessary here is a 200 yard shot and a draw or hook if you can do it. For once I hit the perfect shot here. My drive rose from the tee box and made a perfect turn left as if it were being radio controlled. I wish my execution was always that good! The photo below is my approach shot on the 13th hole which was only about 110 yards after my drive put me in position A. Below is a photo of the bunkering around the 13th green. There is a fair bit of this style of bunker wrapping around the greens at Shoreacres. The 14th hole is a Redan template hole playing 185 yards and to a par of 3. This is the first time I can ever remember seeing a Redan hole with the hole location on the right side of the green. Below is a photo of the 15th hole taken from the tee. 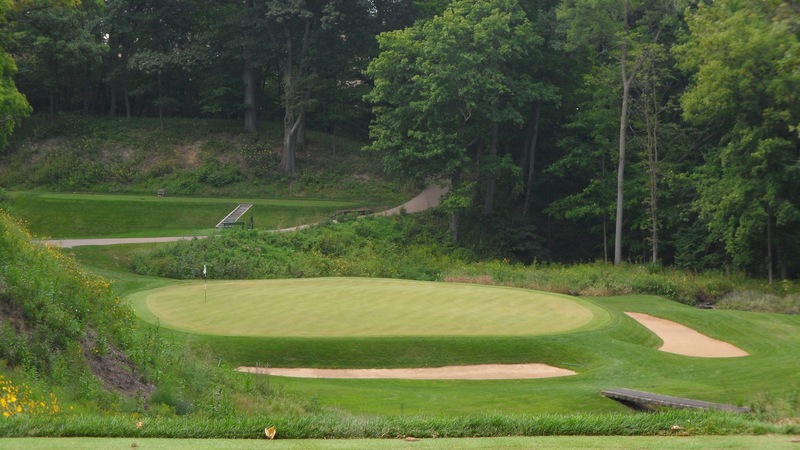 This hole plays 478 yards (coincidentally the same distance as the 1st hole) to a par of 5. Again the ravine is in play on the drive so long hitters need to be cautious. The best line is to drive the ball over the ditch in the foreground and get it out in the middle of the fairway just short of the ravine. Below is a photo looking back down the hole. The ravine is a bit more visible in this photo than in the previous. This green is reachable in two, but I took 3 to get there and earned my only birdie of the day the old fashioned way by sticking it close and one putting. The 16th hole is a fairly straight forward par 4 that we played from 406 yards. The fairway is nice and wide, but the fairway contains some contours that can result in a difficult lie for the approach shot. Here is a photo of some of the contouring of the fairway. 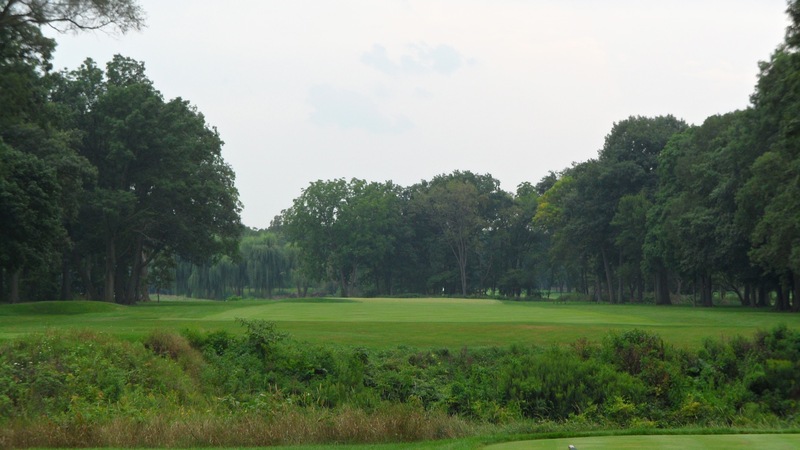 The 17th hole, pictured below, is a short par 4 that we played from 330 yards. I foolishly hit driver here when all I needed was a 200 yard shot. I ended up driving through the fairway and into the very long grass. After nearly giving up we found my ball and all I could do was hack it out and back onto the fairway. This could have been a much easier hole than I made it with my poor club selection on the tee. 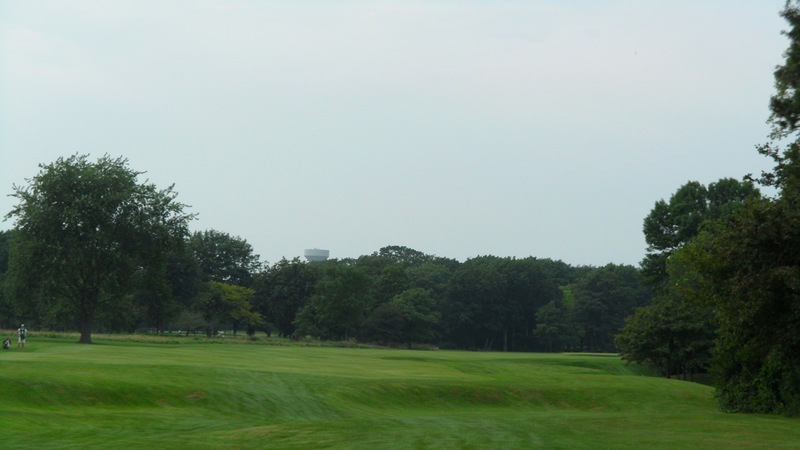 Below is a photo taken from the fairway of the 18th hole which is a 552 yard par 5. Like many of the holes at Shoreacres, this one is fairly generous with the short grass. 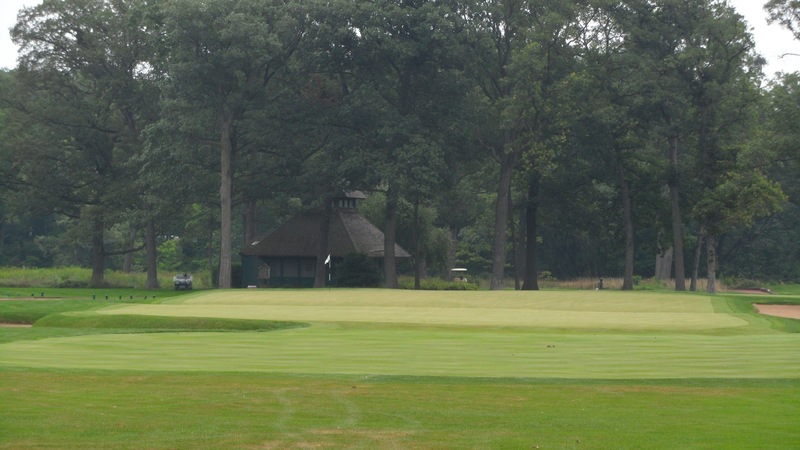 The photo below is of the 18th green complex. The bunker on the left was my undoing here. I hit my third shot onto the green but with a little bit of hook spin which bounced it directly into the bunker. 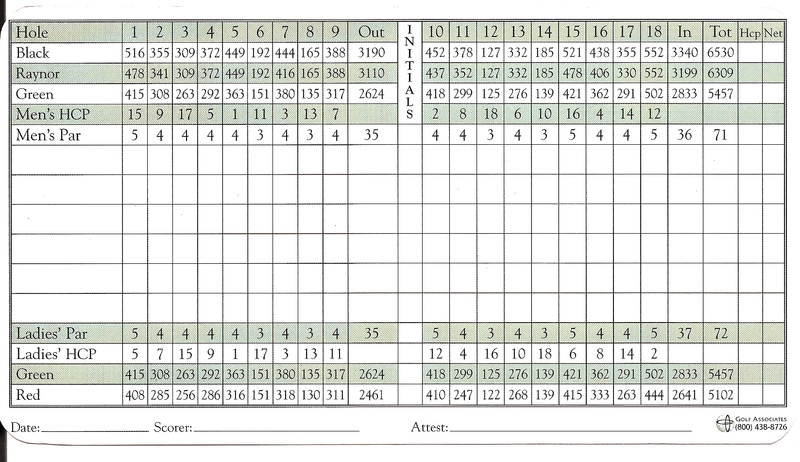 Three strokes later my ball was on the green and 2 putts later I wrote an 8 down on the card for a smooth 80. Ugh. The disaster in the bunker on the 18th hole was not exactly the finish I had in mind considering that I am still struggling to break 80 for the first time, but despite that disappointment I still loved the course. Shoreacres is just the kind of course that I really enjoy. Its fun to play while being challenging but not so much so that a player feels beat up when the game is finished. This is the third Seth Raynor design that I have seen in the last six weeks and I have to say that I am impressed with his work. I’ll be going out of my way to visit as many of his courses as possible. I suspect that I will find few to be as well preserved as Shoreacres. This is truly a special place to play golf. Doak and his crew did indeed do a masterful job here. This entry was posted in The Itinerant Golfer and tagged Golf Courses, Shoreacres by . Bookmark the permalink.